Jan Van Eyck was born between 1390 and 1400 in Maastricht, Netherlands. He spent most of his life in the Netherlands but he occasionally traveled around Europe for the Duke (one of his patrons) looking for new ways to use oil painting. Little is known about his education. It is thought that he was taught by his brother or his dad who were both master painters as well. He was married and had two children and he was a friend to his patron Duke Phillip. He lived an artistic lifestyle throughout his childhood, presumably being taught to paint by his family as a child, as well as teaching one of his sons to paint. Van Eyck, Jan. 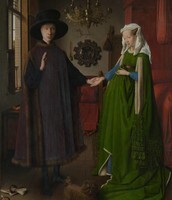 Portrait of Giovanni Arnolfini and his Wife. 1434. The National Gallery, London. 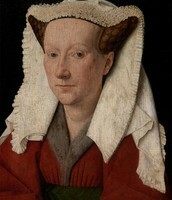 Van Eyck, Jan. 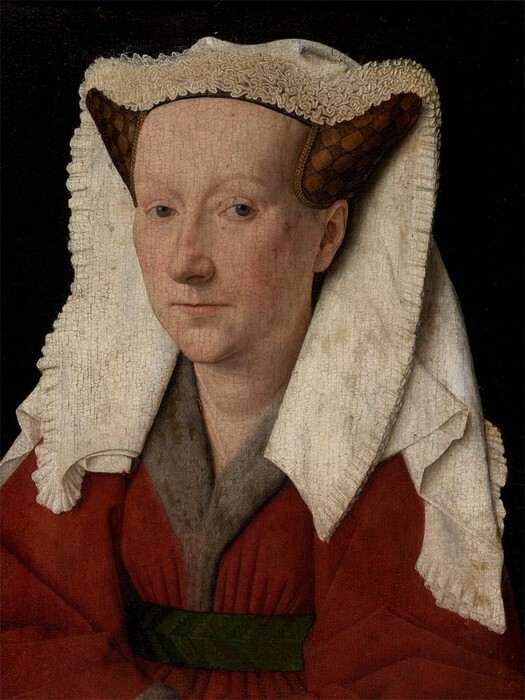 Portrait of Margareta van Eyck. 1439. Groeninge Museum. 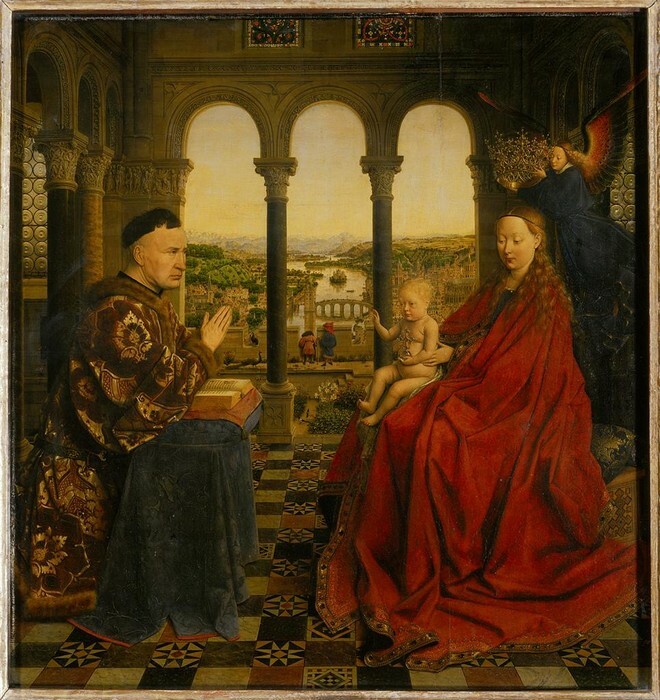 Van Eyck, Jan. Madonna of Chancellor Rolin. 1435. Musée du Louvre, Paris. This piece is significant because it used oil painting techniques that Jan van Eyck had discovered himself, and because in the mirror on the rear wall of the painting, there are two figures entering the room which implies that one of the figures is from the viewers point of view, including the viewer in the painting in a subtle way. The other figure could also be Jan Van Eyck himself, given that his signature above the mirror reads Jan van Eyck was here. This had not been seen before at the time. I personally find this piece interesting because of the mirror and the signature. I find it interesting how Jan van Eyck thought of putting both the viewer and himself into the painting. This to me makes it even more realistic, because if it were taken with a camera in front of a mirror, it would be the same. I am also very fond of the signature because in modern day drawings on classroom tables or bathroom stalls, immature children write things along the lines of "Madison was here" (with their own name, obviously), and I find it funny that Jan van Eyck did the same thing in a piece of art. This piece of artwork exemplifies individualism because it was made for two specific people to celebrate their marriage and to depict their specific faces and characteristics. Garner, Flemming. 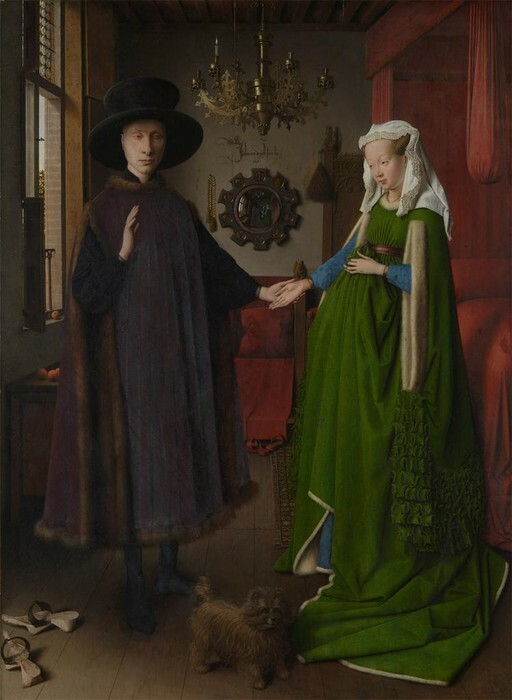 "GIOVANNI ARNOLFINI AND HIS BRIDE: A HOPED-FOR PREGNANCY." Accessed 17 Nov. 2013 <http://www.lagrange.edu/resources/pdf/citations08/GIOVANNIARNOLFINIANDHISBRIDE.pdf>. 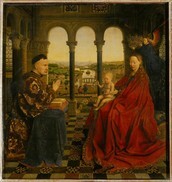 "Jan Van Eyck." 4 June 2013. 17 Nov. 2013 <http://ic.galegroup.com/ic/bic1/ReferenceDetailsPage/ReferenceDetailsWindow?failOverType=&query=&windowstate=normal&contentModules=&mode=view&displayGroupName=Reference&limiter=&u=bedf0311&currPage=&disableHighlighting=true&displayGroups=&sortBy=&source=&search_within_results=&p=BIC1&action=e&catId=GALE%7CDLVPUJ497206219&activityType=&scanId=&documentId=GALE%7CK1639000460>.